As the No. 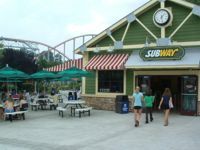 1 fast food chain with more locations than any other quick service restaurant, the SUBWAY® chain is the perfect fit for a park or recreation facility. Visitors want fresh, healthier food choices. The SUBWAY® chain provides flexible partnership options including owning and operating or leasing space to a SUBWAY® franchisee.